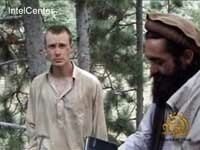 Photo courtesy of IntelCenter This image of Bowe Bergdahl was taken from a video released by his Taliban captors. Nearly three years after finding out their son Bowe was taken hostage by enemy forces while serving with the U.S. Army in Afghanistan, Hailey-area residents Bob and Jani Bergdahl are breaking a long silence, hopeful that renewed awareness about Bowe's plight will lead to his release and return home to Idaho. In an interview with the Idaho Mountain Express, the Bergdahls said they believe Bowe is alive and could be brought home through aggressive negotiations or, possibly, a prisoner exchange. They said they are now vocally supporting grassroots efforts to bring their son's case into the spotlight, in part because of mounting frustration over the inability of the U.S. government to negotiate Bowe's release. "There is a dynamic here that has changed," Bob Bergdahl said. "Everybody is frustrated with how slowly the process has evolved." Pursuant to that frustration, Mr. Bergdahl said he and his wife now want to publicly thank activists across the globe who have initiated petitions and awareness campaigns to recognize Bowe and plead for his safe return to the United States. And, Mr. and Mrs. Bergdahl said, they are advocating that the Pentagon and the White House consider swapping one or more U.S. prisoners being held at Guantanamo Bay, Cuba, for their son. Mrs. Bergdahl said the family has reasons to believe that Bowe is still in captivity in Afghanistan or Pakistan. "We know he is doing as well as he can be," she said. Mr. Bergdahl said he believes a deal to swap Taliban prisoners at Guantanamo for Bowe would be a "win-win" for the United States—his son could be returned safely to Idaho and the government could foster goodwill with the Afghan people. The ongoing imprisonment of suspected war criminals at the Cuba compound and reports of mistreatment of prisoners there encourages anti-American sentiment and might be helping some organizations to recruit soldiers to fight against the United States, he said. Earlier this year, talks between the Afghan Taliban and the United States in Qatar failed, as the Taliban leadership reportedly refused to accept the U.S. demand of a cease-fire before swapping prisoners. Sources in the Taliban reportedly said the group had set up an office in Qatar and wanted to negotiate for five top commanders held at Guantanamo since 2002. Mr. Bergdahl said he and his wife have worried extensively that Bowe has been in danger of being harmed as a pawn of the ongoing war. "Bowe's been (living) under the drone program the entire time," he said, referring to U.S. military initiatives to use unmanned drones to bomb enemy posts. "It scares the hell out of us." At issue is the life of the only U.S. Army hostage being held as a prisoner of the Afghanistan war. Pfc. Bowe Bergdahl is believed to have been captured by Taliban forces on June 30, 2009, while on patrol in Paktika province, in eastern Afghanistan. At the time of his capture, Bowe was assigned to the 1st Battalion, 501st Parachute Infantry Regiment, 4th Brigade Combat Team, 25th Infantry Division, based at Fort Richardson, Alaska. Details of the circumstances that led to his capture remain sketchy. Mr. Bergdahl, a delivery driver for UPS, said his family's focus from the beginning of the saga has been on maximizing his son's safety. For nearly two years, the Bergdahl family did not speak publicly about their son. They were instructed to keep a low profile and let the government work on gaining Bowe's release. On occasion, they released prepared statements through military officials. Meanwhile, they garnered hope through videos with footage of Bowe posted on the Internet by his captors, Taliban militants who call themselves the Islamic Emirate of Afghanistan. Bowe has appeared in five videos released by the group, in July 2009, December 2009, April 2010, December 2010 and May 2011. In the videos, Bowe has pleaded for his release and for an end to U.S. military involvement in the region. U.S. military officials have repeatedly denounced the use of an Army soldier as a tool for propaganda. Then, in May 2011, Mr. Bergdahl broke a long silence when he created and released a three-minute statement in a YouTube video posted online, asking his son's captors to release him. "It is past time for Bowe and the others to come home," he said, later concluding with a message to Bowe: "God bless you! We love you! We have been quiet in public, but we have not been quiet behind the scenes. ... You are not forgotten." As time has passed, people across the nation have offered support to the Bergdahl family. Though some people have accused Bowe of desertion, thousands have made statements—in written correspondence and posts on the Internet—declaring support for Bowe. In the Wood River Valley, where Bowe grew up to become an adventurer and avid cyclist, yellow ribbons in Bowe's honor adorn houses and city streets, and stickers that say "Bring Bowe Home" are displayed at businesses and public venues. Twice, Bowe was promoted, first to the rank of specialist and then to sergeant. Now, in speaking out again, Mr. Bergdahl said he is hopeful that the grassroots movement petitioning for Bowe's release gains new momentum. "We want to get the people going, to raise awareness that there is an American POW," he said. "It's the power of the people. If we could get (comedian) Jimmy Fallon to Tweet about it, that would be something." Mr. and Mrs. Bergdahl said two campaigns this year to free Bowe stand out as examples of how much Bowe's case has touched people across the world. One was a petition drive by Wisconsin Eagle Scout Johnny Weber, 15, who was adopted three and a half years ago by Brenda and Rick Weber of Wausau, Wisc., from an orphanage in central Russia. He started the petition after meeting Sen. John McCain on a trip to Washington, D.C. Weber on April 23 sent to the Idaho Mountain Express a copy of a letter he sent to President Barack Obama. In the letter, he says he collected more than 55,000 signatures. "I would like to know if my family and I can come to Washington, D.C., and hand you the petitions," he says. "I realize you are Sgt. Bergdahl's boss as you are the commander in chief and I believe they belong to you now. ... My vow is to honor our veterans and soldier every day and invite everyone to join me." The second campaign was started in the Himalayan nation of Nepal, where Dr. Nanda Singh has been gathering signatures of supporters in the city of Katmandu. He said his goal is the "safe and speedy release of Sgt. Bowe." The Bergdahls both said they would like to issue a public "thank you" to Weber, Singh and all of the other supporters who have joined their cause. Mr. Bergdahl said Bowe volunteered for Army service because he wanted to help the Afghan people, wanted to be a part of helping the troubled nation rebuild. "His motivation to go to Afghanistan was 100 percent humanitarian," Mr. Bergdahl said. Now, he believes that the mission to free his son is also a "humanitarian project," not a political one. To solicit further support, he said, he plans to speak at an annual demonstration to recognize prisoners of war over Memorial Day weekend in Washington, D.C. The event, organized by the nonprofit POW support group Rolling Thunder, typically attracts more than 100,000 motorcycle riders to the capital. "With all that's going on, we really need a diplomatic path to get this resolved," he said.